From Africa-raised Brit designer Barend Hemmes comes this inspired room-brightener: a regular bulb encased in an oversize doppelganger made from laser-cut wood, which can be either laid on its side, or hung from the ceiling -- so you can stand under it and exclaim "I've had a brilliant idea! ", then look up and say, "Damn. 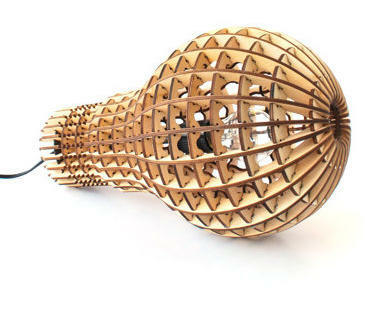 Someone already made a regular bulb encased in an oversize doppelganger made from laser-cut wood."